“St. 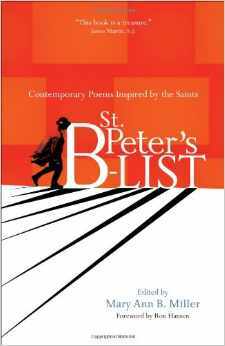 Peter’s B-List: Contemporary Poems Inspired by the Saints,” edited by Mary Ann B. Miller. Ave Maria Press (Notre Dame, Ind., 2014). 288 pp., $15.95. “St. Peter’s B-List,” edited by Mary Ann B. Miller, contains more than a hundred poems, referencing various saints in the context of contemporary spiritual struggle. Honest, touching, sometimes startling, the poets address both the fragmentation and the beauty of ordinary life today. As Flannery O’Connor has written, Catholic artists penetrate “the concrete world in order to find at its depths the image of its source, the image of ultimate reality.” Through the humanity of Christ, in other words, the divine presence manifests itself as human experience. Many of the poems reveal the mystery and miracles hidden in everyday experience. Martha Silano’s “Poor Children of Eve” depicts the endless, regular tasks of a mother who prays, “Lead us away from the temptation to chuck it all … and glory be to dishwashing liquid and the sponge … and to the microwave and Mr. Coffee.” Erika Meitner, in “Miracle Blanket” describes the difficulty of putting her infant son to sleep by an allusion to Nicholas of Tolentino, patron saint of babies, who reputedly resurrected 100 dead children, telling those around to “say nothing of this.” When her son finally sleeps the speaker asks the saint, “O faithful and glorious Martyr, say nothing of this” miracle. The title of the book reflects the last poem, which questions the pre-Second Vatican Council dualism underlying the belief that ordinary people with imperfections can only be second-class saints. The collection as a whole belies this idea, revealing the divine spark alive and well in the diversity of human experience. Also of interest: “A Maryknoll Book of Poetry: Beauty, Truth and Goodness from Around the World,” edited by Michael Leach, Doris Goodnough and Helen Phillips. Orbis Books (Maryknoll, N.Y., 2014). 149 pp., $20. Sister Mona, a Sister of St. Joseph of Carondelet, has taught English for many years in Los Angeles. She is the author of “Under the Skyflower Tree: Reflections of a Nun-Entity,” published by iUniverse.